With the year closing in a few weeks, about 30 million American households enrolled in Flexible Spending Accounts (FSA) are racing to beat the deadline to utilize their remaining dollars. FSAs are plans sponsored by an employer that provide their employees with individual savings accounts for healthcare purposes. The employee’s savings come from a portion of their pre-tax income. The collected funds can be used to pay for a wide range of eligible products and services such as over-the-counter (OTC) medicines, medical tools, and services. Employees who are enrolled in the program are encouraged to spend their remaining 2018 flex dollars before the December 31 deadline (or in some instances, within the allotted grace period). Unused FSAs are forfeited, so employees are encouraged to use their remaining funds on last-minute medical visits and important first aid supplies. Surviveware’s newest addition to their product line, the Large First Aid Kit, is recommended for families who have kids in their household. The product qualifies as an FSA Eligible item and is a proven safety tool for home use. Acquiring this large first aid kit adds more value to an employee’s FSA dollars. Apart from ensuring thorough use of their medical FSAs before the deadline, ownership of these reliable and functional kits increase the protection and safety of one’s household. Contained in durable and malleable 600D polyester fabric, this full-blown large first aid kit possesses the functionality and convenience of an efficient life-saving product. The kit comes with 200 medical items that can be used to treat and stabilize minor to major injuries until professional help arrives. This medical pack contains adhesives, gauze swabs, steri-strips, and wound closure bandages, perfect for households who have toddlers and young children. Having a kit that holds ample supply of wound care can help patch-up injuries that are commonly sustained by preschoolers and elementary students. The large first aid kit also comes with provisions for treating insect bites, splinters, and bruises. In addition, the pack contains a CPR Kit that can be detached from the pack and attached to any keychain. Surviveware leveled-up the contents of this kit and included a mini first aid kit that can be attached to a belt or backpack. An advanced first aid handbook is also included with the kit. These additional supplies are essential in extending the assistance that this first aid kit offers. Moreover, it allows the convenience of having a kit that provides ample guidance and tools that can support first responders during critical situations. A favorite feature of this first aid kit is the labeled and organized compartments. The specific contents and uses of the provisions are printed on the pack’s partitions. Apart from the advanced first aid manual, the labels guide users in identifying and locating the contents of the kit. This is crucial especially during accidents where every second count. 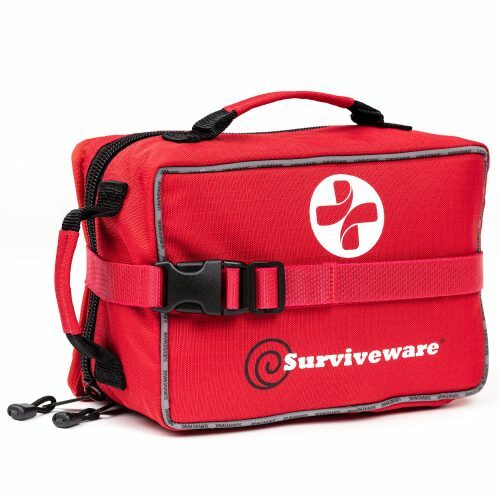 Discover why many people are trusting Surviveware’s first aid kits and purchasing them to maximize their FSAs. Order your very own kit today and enjoy a 20% Amazon discount off your purchase. Take advantage of this limited offer today by clicking here.